There’s a message in her songs. Through Te Reo she sends her message and the messages of her ancestors. 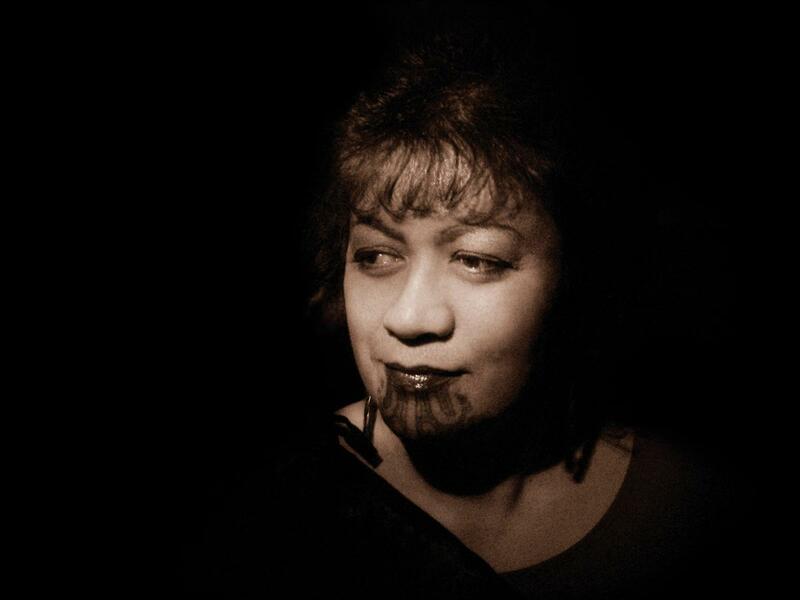 But there is quite an amusing contemporary edge to her messages – almost a political one – when she embraces songs that ‘discuss’ smoking as a major health risk to the Maori people. I reckon it’s definitely a tongue in cheek stance. The sort of songs she was singing are classics – ‘Summertime’ and ‘Black Coffee’ (which almost sounded like the French version sung in Maori). Other numbers included ‘Stormy Weather’, ‘Autumn Leaves’, ‘What A Difference a day Makes’ and ‘The Look of Love’. Her pièce de résistance was ‘Cry Me A River’ which really showed off her vocal ability. What a beautiful singer – she has so much spirit, passion, confidence on stage, and an expressive sharing nature – and when she cranks it up it only gets better! Unfortunately I did not think her guitarist reflected her fabulous presence. One of the reasons I love jazz is the relationship between the musicians and instruments on stage. Live jazz to me is like a conversation, or an argument or whatever, but there has to be that electricity – the spark I guess. I felt the guitarist lacked in this quality. I mean how can such a women with all that front, passion, spirit, talent be brought down by a distinctly average player? Hey you know what? I can’t play the guitar at all and he certainly does have a lot of talent – however it was almost as if he did not ‘fit’ with her. Perhaps, like a relationship of love so to speak, the spark just wasn’t there. That’s just my opinion - maybe I’ve been listening to too much Wes Montgomery! Perhaps a pianist might be a better complement to her music instead? Somebody bold but extremely complimentary. The rest of the band was a solid rhythm section - they did a great job. Some serious Blues were played, and the one I’m thinking of was an original of hers – I won’t attempt to spell it in Maori, I’m not sure how you do – but I believe the direct translation is something like ‘Don’t do it to me’, in reference to her childhood antics with six brothers and two sisters. It had that ‘You Don’t Own Me, I’m not just one of your many toys’ by Lesley Gore vibe to it. Her song is about arguing with someone - “I’m better than you” kinda thing! This is what I mean by her front on stage – she takes the lead and rules the roost! In ‘Autumn Leaves’ again it almost sounded French. “What’s the Maori name for Rain?” she asks mid song….and then sings “ooooooowah!” ['Ua'] It certainly had the required effect on the night! Very amusing; and along with her expressive cheeky facial expressions – fabulous! One of the traditional Maori waiata that she sang was ‘Taku Rakau’ – and I was told that it meant ‘my stick is long/short but it spreads around’. Even though I did not understand the words I thought this song was particularly beautiful. Meeting her myself I thought, what a warm and friendly women – truly a lovely person. Well it’s a huge market – go for it girl!! - Kate Kennedy, International Musician.